You’re in bed, tossing and turning. You can’t sleep. You feel like you are in a financial prison, constrained by the shackles of debt and trying to still have fun and enjoy life. You’re wondering, how the heck am I going to break out of this joint and have financial freedom? In my previous article, we talked about a lot about debt. Today, we’re going to address lifestyle choices and answer this all-important question: Once you’ve identified the lifestyle you want in retirement, how do you get there? 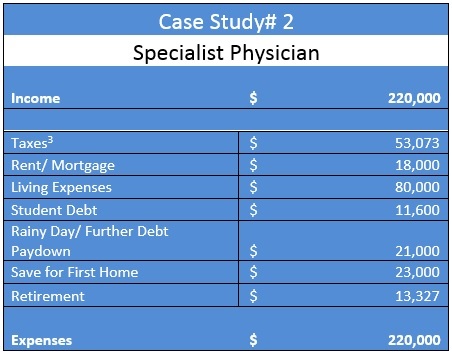 Let’s review the budget case studies from my last article. Remember, specialists tend to earn more. What is a reasonable lifestyle? Although this means different things to different people, I consider it to mean that you aren’t just squeaking by. Perhaps you are able to eat out frequently, go on a vacation, or do things you enjoy while still being committed to keeping your expenses within limits. To help keep an eye on your living expenses, use free budgeting and wealth management tools such as Mint.com, Emoneyadvisor.com and creditkarma.com. Next, how do you balance all of this with saving for retirement? First, contribute to your 401(k). It not only counts towards retirement, but it lowers your income taxes. Second, make sure to contribute at least up to the maximum match that your employer provides. If your employer matches dollar for dollar, this is like an automatic 100% return. Even if your employer matches 50 cents or 25 cents on the dollar, that is still like a 50% or 25% return just for contributing. Lastly, if you are a highly compensated specialist, get close to maxing out your maximum contribution in order to lower both your federal and state income taxes. If you are under 50 years old, the maximum you can put in the 401(k) is $18,000 in 2015. After years of living in small houses or apartments or driving older vehicles, many young physicians feel they’re more than ready to purchase a new home or car when they finally get their first “real” job. Instead of rushing out to buy such big-ticket items, take a moment and think about how those purchases might affect your ability to achieve your long-term financial goals. And bear in mind that your lifestyle can change as you pay off your debt. When buying a home, make sure you can put at least 20% down on the property. If you put only 5% or 10% down, you may be required to have private mortgage insurance (PMI), the cost of which could raise your monthly payment by a couple of hundred dollars. 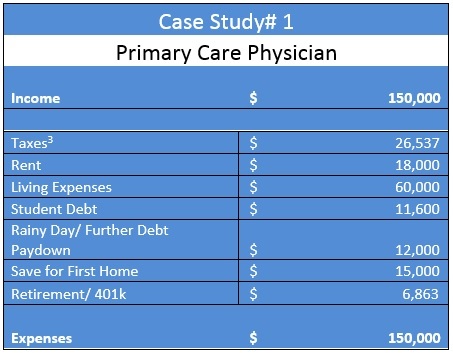 Note that there are some physician specific loan programs that may not require PMI. However, getting in the practice of savings towards a goal is a wonderful form of financial discipline. Remember that cars are depreciating assets. The second you drive a new car off the lot, you typically lose $5,000 to $10,000 of the value. Why put a significant chunk of your hard earned dough in something that you know you will lose money on? Instead of buying a new car, consider buying a used one and holding onto it as long as possible. Financially speaking, buying a low-mileage used car (say with 20,000 to 50,000 miles on the odometer) and holding it for 5 years or more makes much more sense than leasing or buying new. I strongly suggest paying cash for a car. If you already have a high-interest car loan, consider paying it off as soon as possible. If you do decide to get a new car, remember that buying can be a better deal than leasing, especially if you hold on to the car for 5 years or more. If you lease a $20,000 car over 3 years at 6% interest and pay $1,000 down, the total cost over 3 years will be $12,600 plus the down payment. At the end of the lease, you will have paid $4,200 toward the principal of the loan and can either purchase the car or return it to the dealer. If you purchased the same $20,000 vehicle with the same down payment and finance it at 6% interest, you would pay $7,500 per year ($22,500, plus the down payment over 3 years). At the end of the loan period, you will own the car*. If you look at the cost of leasing over 10 years (let’s say that you renew your lease every 3 years) and get the latest model car, the costs for leasing will be at least $42,000 plus down payments. Whereas, if you bought the car and held on to it, the cost will have been $22,500 plus regular maintenance. Buying rather than leasing would save you nearly $20,000. Physicians have big hearts and big dreams. They may want to pay for their kids’ college education, buy the cabin or second home, buy a boat or RV, or give lots of money to worthwhile charities. My advice: Hold off on these things until you are debt-free. Remember that once your debts are paid, you’ll have the cash to fund these other projects. If, as a young physician, you focus on paying off your debts, save for a rainy day, live within your means and put money away for retirement, you can then do the things you’ve long dreamed of doing and be well down the road to financial independence. He is also the author of 5 Steps to Get out of Debt for Physicians, The Insurance Guide for Doctors, The Tax Reduction Prescription, and his latest book, The Freedom Formula for Physicians. You can contact him at (800) 548-1820, at dave@daviddenniston.com, or visit his podcasts at http://www.DoctorFreedomPodcast.com.